The “Hook” to S-World VSN is the “Teleport to GPS” function; it does not take a million ideas to make a great product, indeed often it is best to have just one, and then build the product around the idea. This notion is best summed up by Criss Cox VP of Facebook referencing the “tagging” idea as described in the introduction video within the Facebook careers community page. The concept of S-World VSN is organizing people around where they are and where their friends are. Once one has entered a site via the Maps Tab, a variety of options become available, this screenshot is specific to “Twitter.” Along the bottom right we can see 10 icons representing various social networks and photos products, as we can see the “Twitter” icon has been activated. The list of celebrities selected pops up on the screen in the various locations where they can be found at the time. To the left of the Social Network options are the four locator buttons. These buttons select the type of GPS positioning available. The single dot represents an exact location, from which one can virtually teleport directly to the celebrity and see all that they can see, albeit a virtual representation. The Dot with a single circle represents the locator accurate to 5 miles, indicating what town a celebrity is in but not their exact location. The single dot with two circles indicates a 20-mile approximation, highlighting the City or rough position within a county and the crossed out dot represented the locator is off and the last known or inputted position is indicated. There will be times when celebrities or friends wish to share their location and there will be times when they do not. The option to change the locator on a participant’s smart phone requires only a simple click. Next we move to a simulation of friends abroad. The locator is set to “exact positioning” so only friends with exact positioning turned on can be seen. Please also notice within the Social Network options “Twitter” has been rendered inactive and both Facebook and LinkedIn are active, showing friends from both networks. Centre bottom of the globe we see Zenda Scholtz, as the mouse runs over her picture; the virtual representation of where she is appears. In this case, Zenda is at a pool party. She could equally be on the beach, on Table Mountain, at a Safari, visiting the local vineyards or considering trying the world’s highest Bungee jump. Clicking on Zenda’s photograph enables the “Teleport to GPS” function. After we have “Teleported” to Zenda’s Location, we can “walk around” and see all there is to see using the green buttons found on the bottom right of the screen. The rendering you see is the “SIMS Basic” mode; however, at the click of a button, if available, a Hi Resolution version can be displayed. Please notice the “Simulate People” menu button is green, so the system has simulated people having fun around Zenda. On this topic please note the green halo over the male figure above the green buttons, which indicates a real person, to whom one can initiate a conversation via the “Engage Other” button. The Show Map function is a local highlights map, which one can follow. Skipping back to our “Celebrities on Twitter” page, it is easy to see how the twitter experience is boosted by not only receiving the tweets in the text box, but also seeing where the tweeter is and has been. S-World TV has a number of components. First we shall see how it interacts with S-World VSN, and look back to the example made in July 2011 within the Facebook Product presentation for Criss Cox, which details a day out with U2. In this example we examine interaction from the virtual world with real life footage, in the form of an S-world TV camera crew spending the day with U2 prior to their concert in Green Point World Cup Stadium, Cape Town. Partly due to promotion, partly as they like to interact with their fans, but primarily because Bono wishes to raise money for the residents of the Mandela Park Township, U2 agreed to spend the day before the concert in S-World VSN interactive mode. They turn their cell phone VSN locators to exact positioning and allow a small film team to follow their movements, with one camera filming the band and two others taking artistic shots of the location and scenery. After breakfast, U2 takes a 20-minute boat ride to Robben Island, where Nelson Mandela was incarcerated in the Apartheid years before being released to become president. Bono has a few words to say upon arrival at Nelson’s actual cell and the band members chat and discuss the journey. At any time one can click on the “more info” button and bring up documentary footage about Robin Island, Nelson Mandela, or Apartheid history. After 90 minutes and an amusing incident with a penguin, it’s back to the mainland and the decision as whether to walk or get the cable car to the top of Table Mountain. Partly out of curiosity and in part as a collection of S-World, viewers have some pledged money if Larry Mullen takes a walk. Larry walks while the rest of the band takes the cable car. This works perfectly for the S-World film crew, because it provides more entertainment for VSN viewers as they have two focal points: Bono, The Edge and Adam in the cable car. Shortly after taking in the view, and possibly having a drink, viewers watch as Larry tackles Platteklip Gorge. There is a certain camaraderie that comes with climbing Platteklip Gorge, and it would not be a surprise to find Larry bonding with his camera-carrying counterparts which makes for a much better one-to-one S-World VSN experience, particularly as they chat away on the frequent rest breaks that come between the continuous and unrelenting track up to the top. Larry has the opportunity to talk face to face with his sponsors, which of course makes for more interest and so brings more donations. For some it takes 45 minutes, the average time being two hours. Larry and the S-World crew made it in 90 minutes, which is a noteworthy time, and the $10,000 or so Larry has raised will undoubtedly assist the residents of “The Mandela Park” township. At any time, S-World VSN viewers can switch between actual footage of their journey and the virtual view. Once the band is reunited, it’s on to the next leg of their journey, which is to the Mandela Park Township, 10 miles as the crow flies, 45 minutes via cable car then road, or two and a half hours on foot, going down from Table Mountain across the 12 Apostles down to Constantia Nek. So out come the cell phones and the band watch a 5-minute virtual journey of the more adventurous route. Two and a half hours down is a lot easier than 90 minutes going up, so the band, including Larry who has now reached hero status with those following his day, all take the scenic trail to Constantia Nek before heading into Hout Bay and the Mandela Park Township. Once at the township all the band members go into interactive mode, choosing to speak to various VSN viewers regarding the township as they walk around and meet the largely Malawian and Zimbabwean population who, despite their living conditions, are extraordinarily upbeat and for the most part happy. During this process the charity drive is increased and by the time they leave, fifty thousand dollars or so has been raised for the residents. Now it’s back to the hotel and on to the concert. During the concert, one can simply choose to watch it in standard TV mode, or interact with the audience who are periodically being interviewed. If one knows someone in the audience, one can request they go to a VSN camera for a live chat. Alongside this, one can choose to view the concert from any specific TV camera, swooping from different angles at will. Lastly, each person who uses VSN has an Avatar that can appear on screen, either a simulation of themselves, or an animal or indeed anything one may care to be. The avatar can go wherever it wishes; for example, if the avatar happens to be a kangaroo, the option to jump on stage and bounce around with Bono and the band during the concert is available. All told this is a significantly enhanced experience compared simply to watching the concert on TV. All network companies will be assisted by the Media and Advertising departments to create virtual stores for displaying their wares in highly innovative and creative ways, creating a sophisticated virtual shopping network. Complimenting this, S-World VBN has many convenient organizational tools. The graphic below shows a map-orientated day planner. This example is indicative of someone managing a continental USA business with dealings in Europe, however the map could as easily show a small suburban operation, or simply be a social planner/calendar. 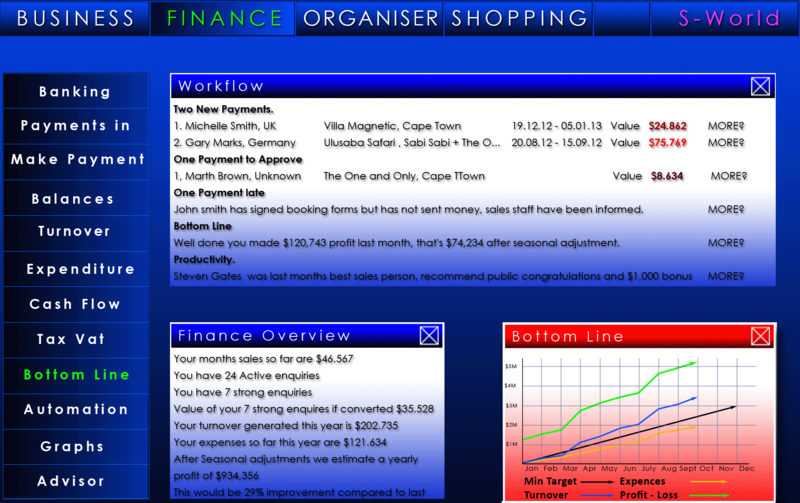 In the left menu, one chooses the appointments to be displayed, the groups of four people indicating the time of video conference meetings, the individual icons in white shirts indicating staff requiring interaction, and the house graphics representing property agents available to virtually show properties as that option is on the user “Dene Steels’” agenda. However Mr. Steels could just as easily evaluate schools, hotels, theme parks, retail stores indeed any product or service needing either a visual stimulus and/or a human description. The “Available Only” tab is also activated and other than ‘save meeting’ reminders, Mr. Steels only sees people who are available to converse at this time. As Mr. Steels moves his mouse over the icons a description and graphic of what the conversation addenda pertains to is displayed, for example in this case, a selection of properties. Following this example let’s consider the workflow of the process of considering the purchase of a property, in this case the property desired as a holiday home investment. Mr. Steels is based in New York, and the first thing to be aware of is there is no pressure to talk to any of the agents at any particular time. Mr. Steels can initiate a meeting at the time of his choosing. Prior to contact, Mr. Steels along with his family and advisors have already taken virtual walk-throughs of many villas and houses and narrowed the selection down. Now it’s time to speak to someone who knows all the pertinent details about the property. Mr. Steels initiates the viewing process by clicking a button. 1000 miles away the realtor “Julie Bride” is having coffee at a friend’s house, when her cell phone makes the much-welcome “ping” sound. She moves to another room, takes out her mini headphones and mic set and welcomes Mr. Steels. Below we see the Billiard room-virtual representation of one of the properties Mr. Steels is interested in. It is portrayed in such detail it’s very difficult to tell the difference between the S-World view and an actual photograph. Mr. Steels is looking at the representation via a computer screen and Julie through her phone, which since she knows the property well, is all she needs. It is, after all, only a reminder and a tool to let her know to which aspects of the property Mr. Steels questions relate. Mr. Steels navigates his way through the house using his mouse or direction buttons and asks Julie any questions he should care to ask. Once all his queries have been answered, they move to the other two houses on his list. Vetting houses in this manner saves Julie time, she needs not worry about getting keys, she saves money in fuel costs, she saves travel time and of course she has no reason whatsoever to go into an office. For Mr. Steels, viewing 9 separate houses and chatting to the realtors in Mexico, California, and Florida after having vetted the 9 from a hundred or so possibilities has saved weeks of time and thousands of dollars. 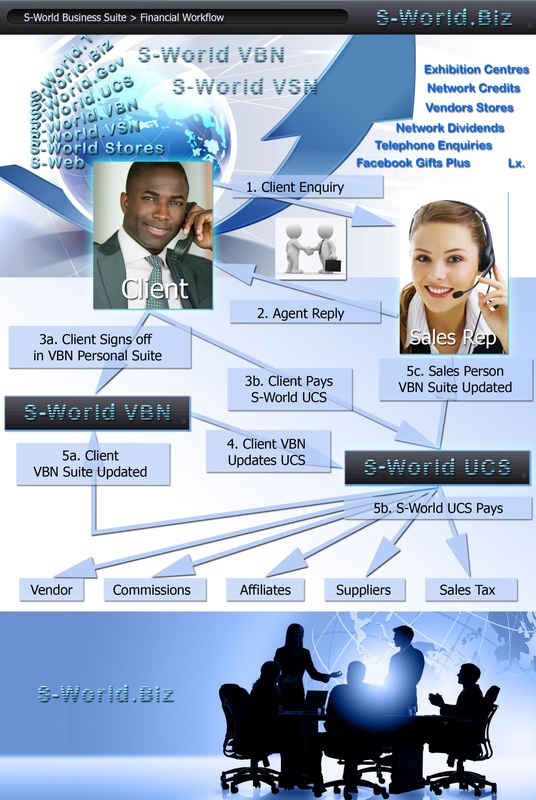 S-World VBN has given Julie the ability to do her job far more effectively, both in time and money, allowing her to do what she does best, which is network with the local community, past clients and new clients who have chosen her as their preferred agent via the many doorways into the S-World network. Julie would have been taught by the rendering teams at the University and operation center how to use the pen laser and rendering software, each time she renders a house, it’s open for agents across the globe to show to their clients, sharing commission. As for as Mr. Steels and his family, the chances of their finding the property that suits them best have increased by a large percentage. It’s worth noting that for each property a list of local amenities, including distance to schools and recreation areas is available at the touch of a button, and one can set filters in this regard. As important is the HPI (House Price Index) that advises of a property’s value in relation to its location factoring in its size and condition. Take away the international aspect and consider a normal property purchase, nearly all people no matter how clever or successful they are, do not have the time to do the proper research in purchasing what in over 90% of cases is the most important purchase they will ever make. If one is to buy a house one should look at every house available from every agent, 50 maybe 100, in VBN this can be accomplished in a matter of hours. Rarely is anyone expected to buy a properly via VBN, rather eliminate the properties that are unsuitable, and then have plenty of time to view diligently the top handful. The exact same virtual views of properties and list of local amenities and attraction also works perfectly for choosing and booking accommodations for a vacation. To the right we see how the same S-World functionality can be displayed in different “skins”, different looks and feel’s from the standard modern IBM style display, to a more classic design as displayed below incorporating the various S-World.Biz business software applications. In the same way one can change the look, feel and functionality of the S-World software, S-Web applies the same principal to the information and products displayed on the standard world wide web. Below we see an example, in the travel industry, specializing in Africa. 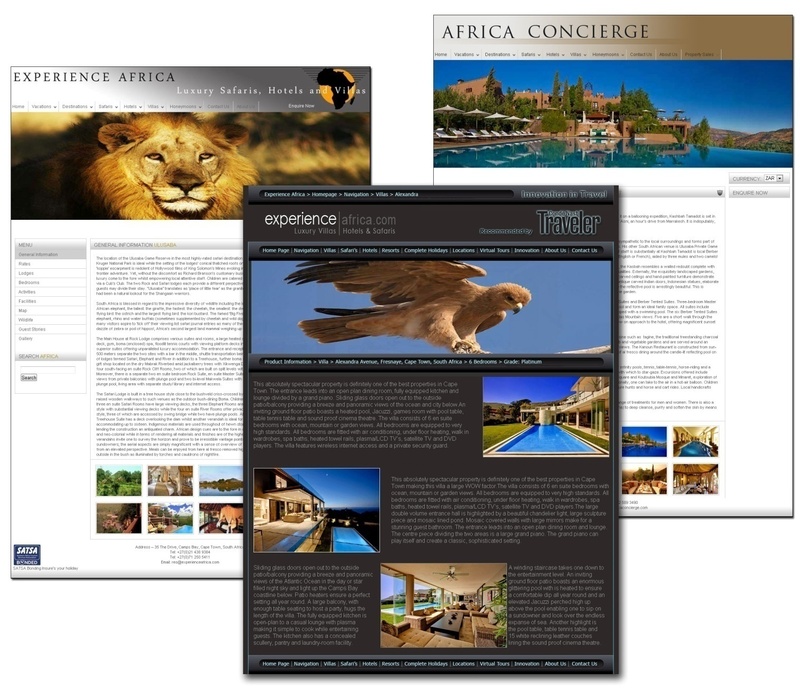 On the left and in the middle, note a company called Experience Africa, the information within the website is the same, it is however presented in two different ways. Experience Africa alongside all businesses will have the choice of tens of thousands of different designs. This is not particularly new in principle, there are many template driven websites available where small companies can add their information. However the principle here is not to make a basic presence, rather to create large informative websites, this requires human interaction and assistance from the Advertising and Media departments at the Universities and operation centers. Alongside adapting and perfecting standard templates to suit each business, when required the Media and Advertising department will create the logo’s and company brand image. Alongside the company products, be they safaris or windows, will be professionally photographed and filmed websites offering at the least a 5-minute company film about themselves and their products. At the most, in the case of Experience Africa, over the years a 30-minute art film and standard presentation and a TV show of each of the hundreds of venues will be available, each one worthy of TV airing, which of course will happen via S-World TV, and in particular S-World TV on demand. (To be detailed later) Perhaps to be interpreted as a “practical” National Geographic-type showcasing hundreds of companies’ products (homes, businesses, construction-ready land) worldwide. Of course alongside the film footage and photographs will be an S-World VSBN (Virtual Social Business Network) 3D representation of each venue, where a client could navigate across an entire game reserve, clicking on movie icons to see actual footage from specific points. Affiliate Marketing: The practice where one company either makes a product or makes a presentation of a product for others to sell, whereby both companies share in the profit. In the case of Experience Africa a good example would be to consider VIRGIN Holidays, a respected global travel company with interest in Africa but despite owning Ulusaba Game lodge VIRGIN is without a significant logistical or visual presence to really capitalize on the African Market. Given the companies would be happy to work together, VIRGIN supplying the Customers and Experience Africa the expertise and in general being located in Africa to welcome and assist their clients. The Experience Africa website information would simply be adapted to VIRGIN’s website, so attracting VIRGIN’s clients who wished to travel to Africa to make enquiries, then after once booked, both share in the profit. If we look again at our graphic, on the right we see the same website but with Africa Concierge branding, in real life this was for Sotheby’s Realty Africa who realize benefits from offering their international clients a travel service, they make money from the travel, and as they have brought their clients to Africa the clients are more likely just to stay with Sotheby’s for their Real Estate needs. Lastly, as an example we will go back to our “example” manufacturing company “The Window Factory:” their website will look great, with films and photos of their products. It will also contain films and photos of many other products from other network companies in the same field maybe a hundred, maybe a thousand, each time someone orders goods from them, they get paid. Alongside this their goods will be on thousands of other network company’s websites and in S-World VBN on line stores, increasing their exposure exponentially. Search Engines: The “Per Human Results” Search Engine will not only keep the pressure on all network companies to perform continually, and it will be providing the most useful results. This aside without giving away too much, if one controls hundreds of millions of websites on different servers, incorporating existing upscale sites, blogs and news feeds, controlled by highly sophisticated web robots. Existing search engines can be manipulated to such a degree that only S-Web websites will show in standard search results for any search engine. Over the following pages we will see screenshots for the S-World.Biz software, specifically 4 modules: Business, Finance, Organization and the CRM (Consumer Relationship Management) module. We shall look at the basics of their integration and examine a few new concepts. With the exception of cash handling to achieve complete financial efficiency one needs to combine seamlessly, consumer ordering, client’s communications, administrative communications and financial recoding. A workflow example within a non-automated office environment may be: Client Enquiry > Sales Reply > Conclusion of Order > Administration Department Advised > Money Received > Sales Person Advised > Client Advised. Initially comes the client INQUIRY, if the client is used to the S-World client content management system then all is well, a new item is added. However, if the inquiry is via telephone or email once the detail is collated, it is sent back to the client via an S-World “New Client” content management suite, to which the client can refer to at any time, recording all interactions, showing progress and allowing changes or amendments if possible. After communications with the sales reps are concluded, the client is asked to sign off on his order. This is a vital part of the procedure, essential in some industries, travel for example. If the client is booking two weeks accommodation and the date is 17/8/2012 when it should have been 17/9/2012, it could be disastrous, hence the need for the client to sign off on his order. Once the booking is signed off, the information goes to the admin department. Indeed, the admin department in many cases is no longer necessary. The usual job of the admin department would be to correlate the order information, update schedules, enact the dispatch of or book an item, input the data into a spread sheet or financial program then check the bank for the payment then update the financial program and inform the sales person and the client. However, the S-World.biz system does all this, in such a way there can be no mistakes, no data capturing errors, no payments incorrectly assigned, no incorrect dates put into the schedule, no forgetting to tell the sales person. All tasks are automated and the client’s content management suite is updated at every stage. Creating all-encompassing business software requires various patents to be relaxed, workarounds can be made but are not always ideal, including patent holders as priority partners will circumvent this problem. Before even considering the new additions to business software one needs to consider that an all-in business software solution without cooperation of essential patent holders is impossible to perfect. Thus, due to the inclusion of patent holders within the network, on paper one should start at a point of technological superiority over all competitors. A general note before starting, one of the critical parts of the S-World.Biz software is its customization to specific industry types and that it is an: “all in one package.” Attempting to customize out the box software to a specific industry that is not a typical retail or sales operation is not an easy task. Attempting to link that software further, for instance a financial package that communicates with a customer relations package that communicates with a sales reporting and inventory-holding package is beyond most competent computer people as the software is not designed that way. The S-World.Biz software combines all possible business software into one seamless package tailored to thousands of different industries and sub industries in all languages, tax compliant with all countries. Added to this, it would be free! Below we see the “Business Advisory Page” you can read the various options down the left vertical menu bar, from analyzing partner relationships to general advice lectures to SWOT analyses. 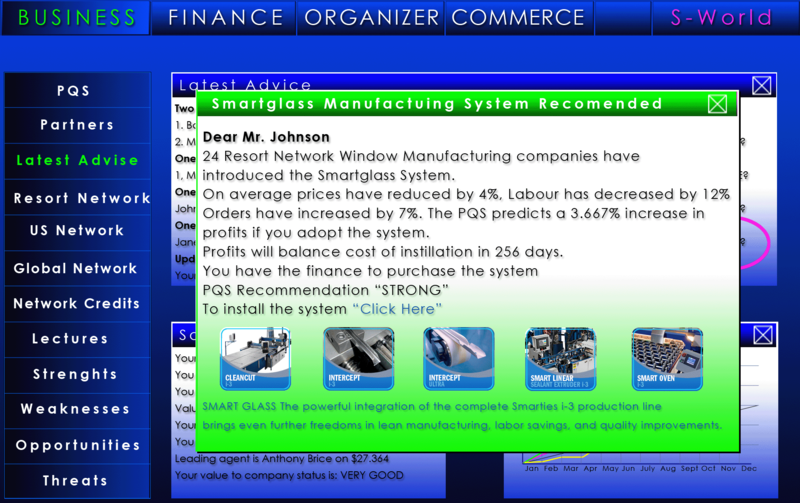 Highlighted is the “Latest ADVICE” pop-up screen which offers suggestions from the Operation Center’s. This advice has been processed from the results of other companies in similar fields, and is well considered, indeed in many cases priceless. This is a good example of the software interacting with the human logistics teams at the operation centers offering a service that is not available from software alone. Below we see the Finance Modal assisting the owner or sales staff of a business in such a way as to make the idea of running a business without an administrative department perfectly plausible. In the “Workflow” we see payment advice, payments in, payments that need to be approved, and late payments. Underneath a seasonally adjusted bottom line profit account and a productivity sales staff report recommending a bonus. The unique aspect to the financial reporting page is the way it calculates the bottom line. Overall profit or loss adjustment, taking into account all future transactions. Month end statement calculated via the network, not what one has spent and received rather what other companies have paid to and received. The latter with the exception of cash handling making fraud all but impossible, the combination of all four methods run simultaneously offers near total financial security, or total financial security. The Organizer incorporates a host of sub applications; it becomes an e-mail client, a task improved by setting keywords. Many companies do not have time to crawl through all the “info@” emails, and when sales staff moves on, over time many potential “buy” emails will be lost in the system sent to their redundant email addresses. By setting keywords such as a book, booking, order, purchase alongside various product names valuable communication will be saved from the cyber bin. Client relationships are championed within the virtual calendar, making even the most unapproachable or simply shy company representative appear gracious, competent and thoughtful, this endeavor culminates in the sending of gifts. Indeed it was this concept, going above and beyond the competition in respect of “Keeping the Customer” that leads to the Facebook Gifts adaptation. The “I See You” recruiting software contains among other useful staff relations applications various physiological tests, which can initial assist in screening new recruits before interviewing and further assist during an interview as the tests let you know what the candidate is really thinking. The program also works within the workspace offering regular tests which let the boss or management assess the mood and teamwork, excellent for working out which motivating factor will get the most out of each employee, and indeed discovering negative traits. The commerce section deals with buying and selling activities: Price adjustments, marketing campaigns, assessing the search engine rankings, inspecting and enhancing core partnerships. Alongside the above, the S-Web functions are managed here, enabling users to expand upon, update or generate new websites, create new affiliate partnerships by adding a product made by another company to the website or asking another to add your product to their website, this task is largely automated and becomes as simple as a single click. Profit Share, Bonuses and Dividend yields are managed here two, this is where owners, management and floor employees can see company performance in relation to profit share, and receive tips on how to increase their yield. The commerce page also acts as a purchasing hub, reverse engendering the selling process, those that know how to sell via the Commerce page will be equally adept at purchasing, be it business supplies, investments or personal items. The specific tab open “Latest Offers” illustrates various Resort Network properties on sale below their “HPI” (House Price Index) value. 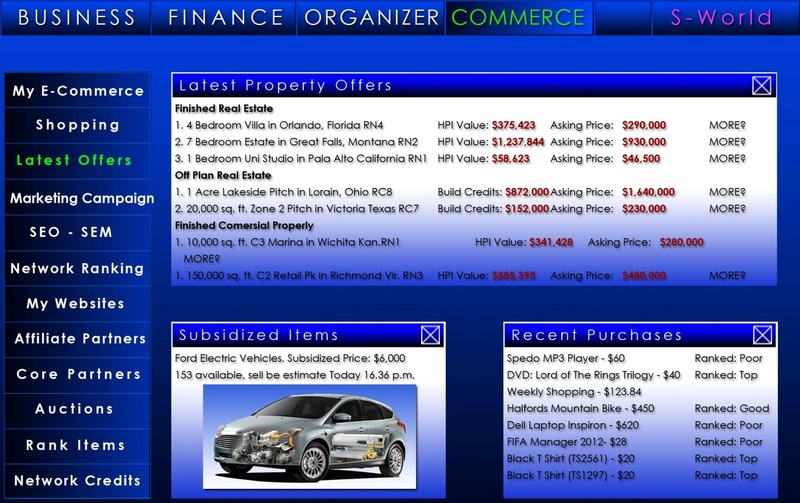 The “Subsidized Items” tab shows items that the network has subsidized, for instance to promote electronic cars, the car below would cost $10,000 but is available for $6,000. Alongside Facebook Gifts, the following S-World software, travel and real estate concepts are covered in detail within the concluding two chapters of this book, and various chapters on the www.s-world.biz website. Much like Facebook gifts, the S-World environment S-World VSN (Virtual Social Network) is at its heart a simple concept, in essence the internet viewed via a 3D simulation of the world, popularized by the ability to see where your friends are via their cell phones GPS’s, and the ability to “teleport’ (zoom) to their location seeing their Avatar within a 3D virtual representation of their location, where one can look and walk around seeing all that can be seen. If one’s friend is lost, one could even give them directions. In S-World, everything is as it should be except the shops, which change to the S-World and Businessbook’s member’s shops. Once a shop is entered one can interact with the company’s sales staff, via their Avatar or Skype. Or just browse a sophisticated display of the company’s services or stock displayed, photographed, filmed and rendered in a superior fashion, for little or no cost by the media teams that support the network. In retail, for instance, instead of a photograph of a dress, movie clips on the catwalk and various locations are presented. For travel and Real Estate, a detailed 3D walkthrough of the venue is available alongside photographs, reviews, client ratings, engineer’s and architect’s plans. Whilst the gimmick of the virtual world is walking into the shops, the shops could be accessed by many portals, Facebook, websites, search engines, smart TV’s and smart phones to name but a few. All goods sold on the network via S-world, Facebook gifts, S-Web or other internet portals, are rated by clients. Poor ratings see product lines or accommodation venues dropped, thus the network becomes and incorporates a “per human experience” search engine. 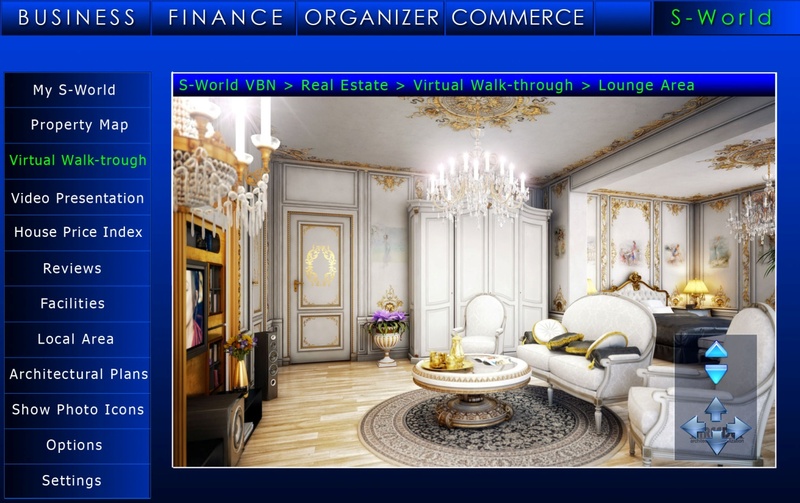 The voting panel is accessed via the S-World profile page, which can come in many forms, its default a 3D room with various doors for various actions, once inside one has access to all products and services purchased presented in a engaging manor. As an attractive incentive, members S-World retail credits are given each time a vote is cast. In addition to this, many staff and companies on network are impressed by profit share and dividends, which are paid in the form of network credits, and can be used to buy anything from houses to ant farms. To further incentivize the voting until previous votes have been cast new credits can not be used. There are many factors making the voting system very hard to hack and manipulate. The most obvious being, if one does not buy a product, one can’t vote on it. Voting is often a tiresome process thus votes will not be detailed, just a simple choice of, poor, good, or excellent. Various safeguards protect against “luck of the draw” votes, negative people vs. upbeat people’s votes averaged over time. All search engines are desired as primary partners, who receive payment for each purchase made via their introduction. As goods are rated by humans, search engines can happily and fairly rank high vote scoring S-World & S-Web affiliated websites above all others. While S-World is designed to replace the e-commerce on the internet, stand alone websites for retail, travel, real estate, and services are far from ignored. S-Web provides attractive database-driven free websites, offering many formats and designs. Clients simply upload product pictures, write a description and add prices. If a company already has a database- driven website the databases are synchronized. The main financial advantage for all is the ability to add complimentary stock and services from any other company on the network, taking a commission each time someone makes a purchase. The process also works in reverse; other companies on the network can choose to display and sell your goods and services. There is another contingent to the S-World e-commerce family: S-World UCS was first envisaged in 2004 it combining a tutorial simulation, in the form of a colonization game, which, when mastered, allows one to conduct real business. Put together Facebook gifts, S-World VSN, S-Web, S-World UCS and the “per human experience” search engine and one has every right to say the combination will take a big bite out of e-commerce market’s share, especially considering the good PR and branding. The internet is a hit or miss unmonitored devise, there is little point reinventing the wheel, unless the wheel is square. The internet is like a square wheel. S-World & S-Web improves the experience and representation. The “per human experience” search engine monitors and so improves the quality of goods and services for the consumer, making the square wheel circular, with the exception or rogue traders and cowboy films, every one wins. S-world is not designed only as an internet and smart phone device. Over the next few years smart televisions will become the norm. S-world is designed to become the industry standard operating environment. Not only is S-World a great product, the overall network from the start has made provisions for the creation of many localized TV series, and high-budget series and films each year. The larger the network, the more media created. Current Media Company’s essential to both positive PR and the goal of becoming the industry standard operating environment for smart TV’s are included in the share options available for ownership of S-World alongside the technology companies and electronic communication devices manufacturers. There is no individual company that will own S-World. S-World will be owned by all that help to build and promote it. All that is sold on the S-World network is from partners, so the financial aspect is simple; the exact mark up/levee/commission varying from industry to industry, profits to be split between the partner companies that create S-World and the referring entity, be it a search engine, a media company, a TV manufacturer, or the browser on a computer or smart phone. Currently about 20% of holidays are booked on line. About 50% of people choose their destination via the internet, then book through a high street operator, largely for safety reasons. Tourism accounts for about $900 billion each year, and business travel seems to be higher. It certainly is in the USA, total global travel estimates are about $2.5 trillion, 3.5% of Global GDP, a percentage not to be taken lightly. Once again, there is no point introducing a system if it is not an improvement. A number of initiatives help to do just that. First, Safety: As S-World is part of a major organization, travelers can book without concern for false representation as assisted by the “per human results” search engine. Second, the Agent Initiative: knowing the industry intimately, first-hand knowledge is a very important factor. High street travel agents and large travel agencies have staff who usually have never been to the country they are recommending, let alone the venue, and are usually offering the venue that offers the highest commissions. S-world travel seeks to recruit individuals from the towns that clients wish to visit. The system offers the venues, thus S-World travel reps and agents only need refine the clients’ choice. Different representatives will be available to clients. For instance, if a group of fun-loving twenty something’s wishing a lively holiday, choose a “nearly made it” model or actor, it makes sense as they can recommend villa parties, lively beaches, advise on the best nights to go to clubs and indeed in most cases get themselves on the guest list. However if one wished a cultured holiday experience mixed with visiting some wine estates, the customer can choose a representative with similar interests. Third, S-World 3D Virtual Representations: Simple photographs and write-ups rarely tell the whole story, especially if wide angle lenses are used. While one can be relatively sure a top-end hotel is fairly well represented, small hotels, guest houses and villas are not so particular. By taking a walk through the venue, one ascertains the entertainment flow, size of the swimming pool, view from windows, indeed one could feasibly pick a particular room because of the view. 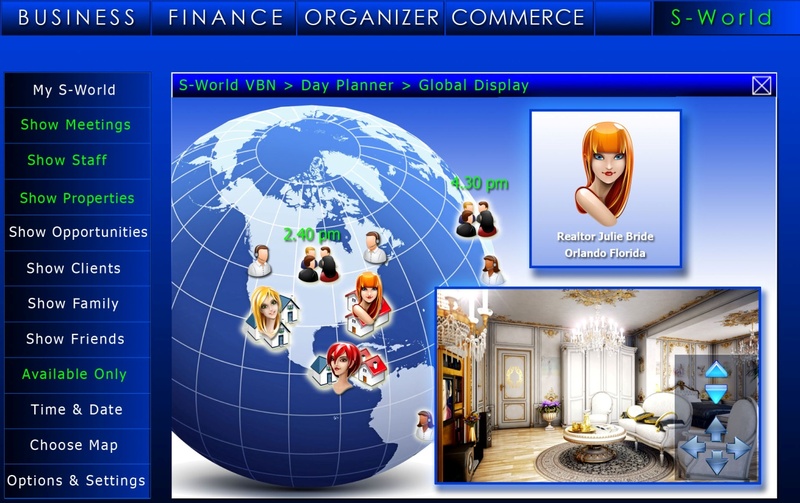 Throughout the 3D walkthrough, icons are available that show real pictures and a collection of guest comments and general blurbs are available. The option to walk around the venue, seeing how far it is to local attractions, and indeed see what local attractions are available, is an influencing bonus. How exactly is S-World going to map much of the world in 3D when Google has been trying for a year and has mapped only a very small proportion would be a fair question, the first key is simplicity, preferring to partner and use “The Simms” technology where an 8-year-old can design and furnish a house within twenty minutes is a good starting point. The operation centers have a large staff contingent called “Spartans” who can assist. S-World travel representatives will render accommodation venues and local surroundings as their name will be attached. Some tourism boards will pay to be rendered alongside venues that wish a level-two representation. The largest factor however will be the gamers playing S-World UCS. All one needs is a pen laser and a camera and hey, presto, that street in “Call of Duty” is your street. The same advantages presented in travel, also can be used in real estate, not that many people would ever buy a house they have not seen. However via the S-world representation they can eliminate properties that are not suitable. Knowing the industry well, it is strongly advised if a client is looking in a certain area, be it a specific town or general area, it’s best to see every house from every agent, maybe over a hundred, with a few hours on S-World and a task that less than 1% of people ever perform is achieved with ease. Location, location, location is a major factor within the business plan, adding percentages to houses due to enhancing or detracting local features. It’s simple enough to attain the land registry document of houses sold in any area, which gives a baseline price for different house types, both in bedrooms and size, adding the location factors, and further tightens up an estimate. Add an agent’s personal opinion, where they are penalized for exaggerating and one has an accurate base line sale price. For sellers that are not duly fussed over and coached, the sale price maybe 10% more as, purchasers will perform what is known as a love buy, based on their emotions only. On the other hand if a client is in a hurry to sell, they can price the property under the estimate. Banks and financial institutions selling a repossessed property can offer even lower prices, and in this case, one could see property moguls buying on the S-World representation alone. Once a critical mass of Real Estate is displayed on S-World, most would assume if a property was not represented, it was overpriced. Alongside suggested selling prices will be suggested prices for remodeling the property and upgrading where needed. S-World is an abbreviation for Sienna’s World named after my daughter, the most beautiful baby in the world. I know, every father says that about his daughter, but one has to admit she’s a cutie. On informing my farther about the make-up of the business and networking software plus my decision to name it after Sienna, he came up with a rather pertinent acronym. As the environment the SIENNA software lives in is to be a Virtual World, the word “World” was added, thus resulting in making Sienna’s World, shortened to “S-World.” Within S-World’s Virtual World, Sienna will appear as an Angel helping to bring attention to specific items of interest. While in many ways much of the second and third part’s of American Butterfly are dedicated to the Sienna software, this chapter offers a friendly and simplified overview of the basics. At best they are a collection of super summaries, as each page you are about to read requires a book all to itself. Then one needs to put all those books together, much like the economics within American Butterfly. The construct of the software is circular, with each component adding versatility and strength to the others. By the time we have reach the end of American Butterfly Part 3 we will have delved deep into Quantum Mechanics and String Theory to adapt this software into a time machine of sorts, creating simulations of our reality and sending them forward in time to help us learn from our future mistakes and triumphs – before we even encounter them, well our business mistakes at least, but in this time of economic uncertainty, it’s still very cool. We are in for quite a ride, but for now, for this chapter, we are keeping life nice and simple. S-World VSN is the oldest concept within American Butterfly. It began in 2000, and by 2002 my company had developed the world’s first commercial mapped Virtual Tour for popular internet usage, where one zooms in on animated maps, clicks on scenes or buildings to look at 360-degree movies, and from where one could book accommodations. The 2012 update changes the 360-degree movies into 3D renderings that can be accessed, walked into, or encircled. 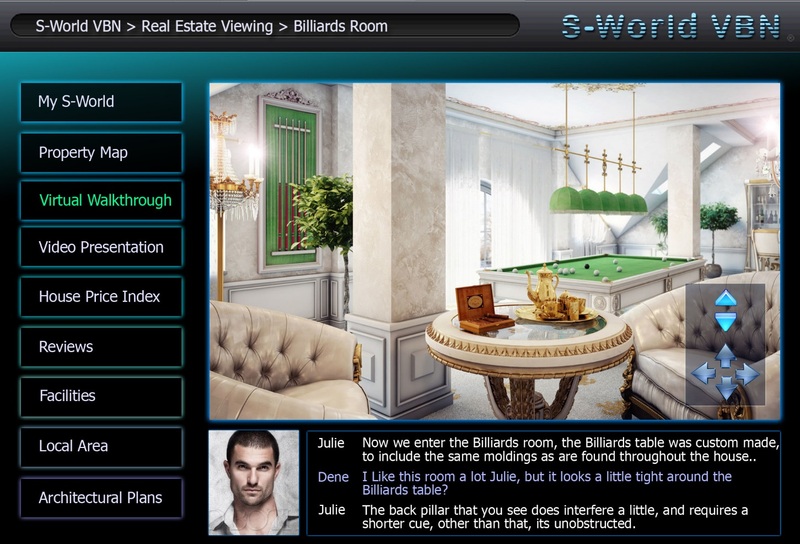 S-World VSN (Virtual Social Network) sees the creation of a Virtual World that mirrors real life. The simplest explanation would be to consider Google Maps in 3D, where instead of just looking down at a 2-dimensional flat image, one adds the dimension of height so one can walk under bridges, into houses and swim in bodies of water. If one has played the Sims, one will already have a good picture, indeed the Sims and Pixar are desired as primary partners in S-World VSN. If one has not seen the Sims, please consider any computer game where a player’s avatar can move. Or consider a recent animated film; imagine you can pause it, then pick a character and direct the character around the animated environment. Unless the owner of a private property opts for their property to be displayed in 3D within S-World, only a 2D image will be available and VSN users will not be able to move their avatar onto the visual image. The 2D Image will be similar, or the same, as seen in Google Maps. The rendering process will start with Satellite Imagery, alongside the standard flat overhead view, various angles will also be photographed, once combined with existing global map data from all sources then triangulated, S-World VSN: 001 will be completed, with a reasonable degree of accuracy. Besides current popular animation techniques, great attention will be placed on fractal geometry. From this point there are various initiatives to improve the accuracy of S-World. At each operation center there is a dedicated rendering department. At times it will render properties or areas directly, albeit its primary function is to teach others how to use the basic equipment and software, as the software will be based around the Sims. Once shown how to use a pen laser, anyone 12 and older could make a professional rendering. The Travel and Real Estate industries will see the advantage in professionally rendering their establishments and their destinations, and real estate agents will perform this task free of charge. In the case of upscale homes and resorts, a more professional rendering can be performed for a fee. Gamers and S-World VSN fans will have the opportunity to be in charge of a specific area for them to upkeep, for which they will receive EEE Points, and network credits. In general, Tourism Boards and local authorities will see the advantage in assisting the rendering of their specific areas.